For the glam metal singer, see Dean Davidson. Not to be confused with Dixie Dean. 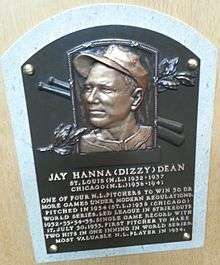 Jay Hanna "Dizzy" Dean (January 16, 1910 – July 17, 1974), also known as Jerome Herman Dean, was an American professional baseball player. He played in Major League Baseball as a pitcher for the St. Louis Cardinals, Chicago Cubs and the St. Louis Browns. A brash and colorful personality, Dean was the last National League pitcher to win 30 games in one season. After his playing career, he became a popular television sports commentator. Dean was elected to the Baseball Hall of Fame in 1953. When the Cardinals reopened the team Hall of Fame in 2014, Dean was inducted among the inaugural class. Dean was best known for winning 30 games in the 1934 season while leading the 1934 "Gashouse Gang" St. Louis team to the National League Pennant and the World Series win over the Detroit Tigers. He had a 30–7 record with a 2.66 ERA during the regular season. His brother, Paul, was also on the team, with a record of 19-11, and was nicknamed "Daffy", although this was usually only done for press consumption. Though "Diz" sometimes called his brother "Daf", he typically referred to himself and his brother as "Me an' Paul". Continuing the theme, the team included Dazzy Vance and Joe "Ducky" Medwick. The Gashouse Gang was the southernmost and westernmost team in the major leagues at the time, and became a de facto "America's Team." Team members, particularly Southerners such as the Dean brothers and Pepper Martin, became folk heroes in Depression-ravaged America. Americans saw in these players, dirty and hustling rather than handsome and graceful, a spirit of hard work and perseverance, as opposed to the haughty, highly paid New York Giants, whom the Cardinals chased for the National League pennant. Much like later sports legends Joe Namath and Muhammad Ali, Dizzy liked to brag about his prowess and make public predictions. In 1934, Dizzy predicted, "Me an' Paul are gonna win 45 games." On September 21, Diz pitched no-hit ball for eight innings against the Brooklyn Dodgers, finishing with a three-hit shutout in the first game of a doubleheader, his 27th win of the season. Paul then threw a no-hitter in the nightcap, to win his 18th, matching the 45 that Diz had predicted. "Gee, Paul", Diz was heard to say in the locker room afterward, "if I'd a-known you was gonna throw a no-hitter, I'd a-throw'ed one too!" He also bet he could strike out Vince DiMaggio four times in one game. He struck him out his first three at-bats, but when DiMaggio hit a popup behind the plate at his fourth, Dean screamed at his catcher, "Drop it!, Drop it!" The catcher did and Dean fanned DiMaggio, winning the bet. Few in the press now doubted Diz's boast, as he was also fond of saying, "If ya done it, it ain't braggin'." Diz finished with 30 wins, the only NL pitcher to do so in the post-1920 live-ball era, and Paul finished with 19, for a total of 49. The Cards needed them all to edge the Giants for the pennant, setting up a matchup with the American League champion Detroit Tigers. 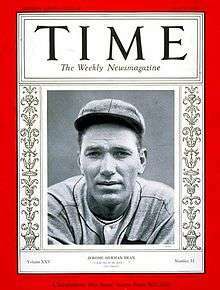 After the season, Dizzy Dean was awarded the National League's Most Valuable Player Award. Dean was known for antics which inspired his nickname. In time, perception became reality. In Game 4 of the 1934 World Series against the Detroit Tigers, Dean was sent to first base as a pinch runner. The next batter hit a potential double play groundball. Intent on avoiding the double play, Dean threw himself in front of the throw to first. The ball struck him on the head, and Dean was knocked unconscious and taken to a hospital. The storied (and possibly apocryphal) sports-section headline the next day said, "X-ray of Dean's head reveals nothing." The St. Louis Post-Dispatch and the Detroit Free Press merely stated that the X-rays "revealed no lasting injury". However, Dean was reported saying his head was too hard for a baseball to hurt it. Although the Tigers went on to win the game 10-4, Dean recovered in time to pitch in Game 5 which he lost. After the Cardinals won Game 6, Dean came back and pitched a complete game shutout in Game 7 to win the game and the Series for the Cardinals. In the World Series the Dean brothers accounted for all, with two each, of the Cardinals wins. Dizzy Dean 1933 Goudey baseball card. While pitching for the NL in the 1937 All-Star Game, Dean faced Earl Averill of the American League Cleveland Indians. Averill hit a line drive back at the mound, hitting Dean on the foot. Told that his big toe was fractured, Dean responded, "Fractured, hell, the damn thing's broken!" Coming back too soon from the injury, Dean changed his pitching motion to avoid landing as hard on his sore toe enough to affect his mechanics. As a result, he hurt his arm, losing his great fastball. By 1938, Dean's arm was largely gone. Chicago Cubs scout Clarence "Pants" Rowland was tasked with the unenviable job of obeying owner P. K. Wrigley's direct order to buy a washed-up Dizzy Dean's contract at any cost. Rowland signed the ragged righty for $185,000, one of the most expensive loss-leader contracts in baseball history. Dean helped the Cubs win the 1938 National League pennant. The Cubs had been in third place, six games behind the first place Pittsburgh Pirates led by Pie Traynor. By September 27, with one week left in the season, the Cubs had battled back to within a game and a half game of the Pirates in the National League standings as the two teams met for a crucial three-game series. Dean pitched the opening game of the series and with an ailing arm, relied more on his experience and grit to defeat the Pirates by a score of 2 to 1. Dean would later call it the greatest outing of his career. The victory cut the Pirates' lead to a half game and, set the stage for one of baseball's most memorable moments when in the next game of the series, Cubs player-manager, Gabby Hartnett, hit his famous "Homer in the Gloamin'" to put the Cubs into first place. The Cubs clinched the pennant three days later. Dean pitched gamely in Game 2 of the 1938 World Series before losing to the New York Yankees in what became known as "Ol' Diz's Last Stand." Dean made a one-game comeback on September 28, 1947. After retiring as a player, the still-popular Dean was hired as a broadcaster by the perennially cash-poor Browns to drum up some badly needed publicity. After broadcasting several poor pitching performances in a row, he grew frustrated, saying on the air, "Doggone it, I can pitch better than nine out of the ten guys on this staff!" The wives of the Browns pitchers complained, and management, needing to sell tickets somehow, took him up on his offer and had him pitch the last game of the season. At age 37, Dean pitched four innings, allowing no runs, and rapped a single in his only at-bat. Rounding first base, he pulled his hamstring. Returning to the broadcast booth at the end of the game, he said, "I said I can pitch better than nine of the ten guys on the staff, and I can. But I'm done. Talking's my game now, and I'm just glad that muscle I pulled wasn't in my throat." In the 1950s, he appeared in guest starring roles on Faye Emerson's Wonderful Town on CBS and on The Guy Mitchell Show on ABC. Following his playing career Dean became a well-known radio and television sportscaster, calling baseball for the Cardinals (1941–46), Browns (1941–48), Yankees (1950–51), and Atlanta Braves (1966–68) and nationally with Mutual (1952), ABC (1953–54), and CBS (1955–1965), where he teamed first with Buddy Blattner then with Pee Wee Reese. As a broadcaster, Dean was famous for his wit and his often-colorful butchering of the English language. Much like football star-turned-sportscaster Terry Bradshaw years later, he chose to build on, rather than counter, his image as a not-too-bright country boy, as a way of entertaining fans: "The Good Lord was good to me. He gave me a strong right arm, a good body, and a weak mind." He once saw Browns outfielder Al Zarilla slide into a base, and said, "Zarilla slud into third!" "Slud" instead of "slid" became a frequently-used Dean expression. Thanks to baseball fan Charles Schulz, another Dean expression found its way into a Peanuts strip, as Lucy commented on a batter who swung at a pitch outside the strike zone: "He shouldn't hadn't ought-a swang!" Once, describing a player who had struck out, Dean said, "he nonchalantly walks back to the dugout in disgust." While doing a game on CBS, Dean once said, over the open mike, "I don't know why they're calling this the Game of the Week. There's a much better game, Dodgers and Giants, over on NBC." Every so often, he would sign off by saying, "Don't fail to miss tomorrow's game!" During rain delays he was famous for off-key renditions of the "Wabash Cannonball". These manglings of the language only endeared Dean to fans, being a precursor of such beloved ballplayers-turned-broadcasters as Ralph Kiner, Herb Score, and Jerry Coleman. An English teacher once wrote to him, complaining that he shouldn't use the word "ain't" on the air, as it was a bad example to children. On the air, Dean said, "A lot of folks who ain't sayin' 'ain't,' ain't eatin'. So, Teach, you learn 'em English, and I'll learn 'em baseball." Dizzy Dean's number 17 was retired by the St. Louis Cardinals in 1974. Despite having what amounted to only half a career, in 1999, he ranked Number 85 on "The Sporting News list of the 100 Greatest Baseball Players", and was nominated as a finalist for the Major League Baseball All-Century Team. In January, 2014, the Cardinals announced Dean among 22 former players and personnel to be inducted into the St. Louis Cardinals Hall of Fame Museum for the inaugural class of 2014. After leaving sportscasting in the late 1960s, Dean settled with his wife, Patricia, in her hometown—Bond, Mississippi. Dean died July 17, 1974 at age 64 in Reno, Nevada, of a heart attack, and was buried in the Bond Cemetery. Dean's home in Bond was named Deanash, a combination of his name and his wife's maiden name (Nash); it was willed by Dean's wife to the Mississippi Baptist Convention, which operates foster homes for children in a rural setting. The Pride of St. Louis, a motion picture loosely based on Dean's career, was released in 1952. Dan Dailey portrayed Dean. Chet Huntley, who would later gain fame as an NBC News anchorman, played an uncredited role in the movie as Dean's radio announcing sidekick. A Dizzy Dean Museum was established at 1152 Lakeland Drive in Jackson, Mississippi. The Dean exhibit is now part of the Mississippi Sports Hall of Fame & Museum, located adjacent to Smith-Wills Stadium, a former minor-league baseball park. When they asked, Who's the tops? Dean was referenced in the classic TV sitcom The Honeymooners by the character Ed Norton, who justified mooching a second dinner off of Ralph Kramden by saying, "Just like Dizzy Dean warms up in the bull pen before a game, I warm up by having my first dinner." Later in the scene, when tensions rise, Kramden quips "Shut up, Dizzy Dean, and eat your spaghetti!" Dean was parodied in the 1936 Merrie Melodies cartoon Boulevardier from the Bronx with a character named Dizzy Dan. Dean was also referenced in the 1939 Laurel and Hardy film A Chump at Oxford, when Oliver Hardy unknowingly called the character of the actual dean at the famous Oxford University a "dizzy dean". Dean is also featured prominently in some versions of Abbott and Costello's "Who's on First?" comedy sketch. In the sketch, Abbott is explaining to Costello that many ballplayers have unusual nicknames including Dizzy Dean, his brother Daffy Dean, and their "French cousin Goofé Dean" ("goofy" pronounced with a French accent). Actor Ben Jones wrote and performed a one-man play about Dean, entitled Ol' Diz. The United States Congress designated the U.S. Post Office in Wiggins, Mississippi as the "Jay Hanna 'Dizzy' Dean Post Office" in 2000 by Public Law 106-236. On October 22, 2007, a rest area on U.S. Route 49 in Wiggins, Mississippi, five miles south of Dean's home in Bond, Mississippi, was named "Dizzy Dean Rest Area" after Dean. In Morrison Bluff, Arkansas; about 2 miles south of Clarksville, Arkansas; there is a restaurant, Porky's, with Dizzy Dean memorabilia. In 2015, author Carolyn E. Mueller and illustrator Ed Koehler, published an animated book titled Dizzy Dean and the Gashouse Gang. (ISBN 978-1-68106-002-6) The book showcases the antics of Dizzy and his brother Paul Dean, Joe Medwick, Pepper Martin, player/manager Frankie Frisch, and the 1934 St. Louis Cardinals season in their quest to win their third World Series. ↑ "Dizzy Dean statistics". baseball-reference.com. Retrieved 4 January 2012. 1 2 "1934: Dizzy, Daffy and Ducky". thisgreatgame.com. Retrieved 4 January 2012. ↑ "Dizzy Dean at the Baseball Hall of Fame". baseballhall.org. Retrieved 4 January 2012. 1 2 3 "1938: A Rockier Road". thisgreatgame.com. Retrieved 4 January 2012. 1 2 3 "1938 Chicago Cubs Schedule". Baseball Reference. Retrieved 4 January 2012. ↑ "Homer In The Gloamin'". mlb.com. Retrieved 12 February 2011. ↑ Frick, Lisa. Dean, Dizzy. Notable Sports Figures. The Gale Group, Inc. 2004. Encyclopedia.com. 9 Oct. 2009. ↑ Elmo Howell. 1988. Mississippi home-places: notes on literature and history. Page 250. ↑ "Baseball Almanac". Retrieved 2008-01-23. ↑ Mississippi DOT announces dedication ceremony for Dizzy Dean. Gregory, Robert. (1992). Diz: The Story of Dizzy Dean and Baseball During the Great Depression. New York: Viking Press. ISBN 978-0-670-82141-9. Heidenry, John. (2007). The Gashouse Gang: How Dizzy Dean, Leo Durocher, Branch Rickey, Pepper Martin, and Their Colorful, Come-From-Behind Ball Club Won the World Series – and America's Heart – During the Great Depression. New York: PublicAffairs. ISBN 978-1-586-48419-4. Shapiro, Milton J. (1963). The Dizzy Dean Story. New York: Julian Messner. Smith, Curt. (1978). America's Dizzy Dean. St. Louis: Chalice Press. ISBN 978-0-827-20014-2. Staten, Vince. (1992). Ol' Diz: A Biography of Dizzy Dean. New York: HarperCollins. ISBN 978-0-060-16514-7.